X-Mercs is constantly changing, and with each update, we introduce helpful mechanics and interface improvements to the game. We admit that sometimes, it’s hard to find the information that really matters to you among the dozens of lines in the update description. That’s why we are starting a series of brief guides "Fight Smart". We are sure they will help you on the battlefield, commanders. And if you’d like to join the hunt for 300 Morbidium, we suggest you read this guide to the end. Did you know that there is no need for you to open the blue containers that drop from the fallen enemies to get loot? Complete the mission, and the contents of those containers will be added to your reward. In 1.8, we significantly redesigned the Barracks interface. 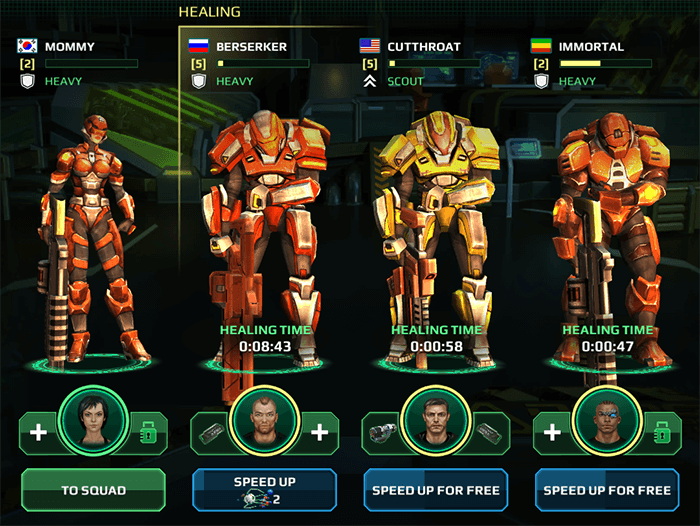 Now, to recruit veteran mercs, you can go to your squad and choose Barracks in the drop-down menu. If your mercs are almost healed or have suffered only light wounds, you can speed up their recovery for free! Also, all mercs that have been healed will automatically return to your squad. Daily rewards don't go away if you skip just one day. Just return to your helpful search droid near Lucy, and he will hand over what’s rightfully yours the next day. If you summon drones to fight by your side during a mission and they survive, you will have them returned to your inventory. Have you encountered Walkers already? Their attacks rip right through armor; they also inflict more damage when they get closer to your mercs. However, you shouldn’t forget that your shotguns work the same way, so let the enemy come close and open fire! Mission difficulty indicators now appear as enemy icons. The more you see, the darker the color, and the harder your mission will be. SHARE YOUR HINTS AND EARN MORBIDIUM! Have you found a fail-proof tactic to beat five heavies equipped with Reanimators? Do you know an easy way to bring down a Juggernaut? Share your knowledge with other commanders in this thread or on Facebook and Twitter! 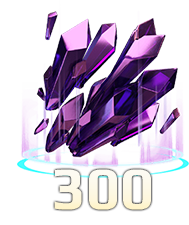 We’ll reward the commanders who are most willing to help out new recruits and provide the best hints with 300 Morbidium. It is not, however, worth a little morbidium to reveal tactics that help you win much more morbidium. The developers must appreciate that a good PMC or Syndicate do not share intel with just anybody. Daily rewards... So it is not necessary to collect them every day? That is good. So I can go on vacation for a month with no ill effects? 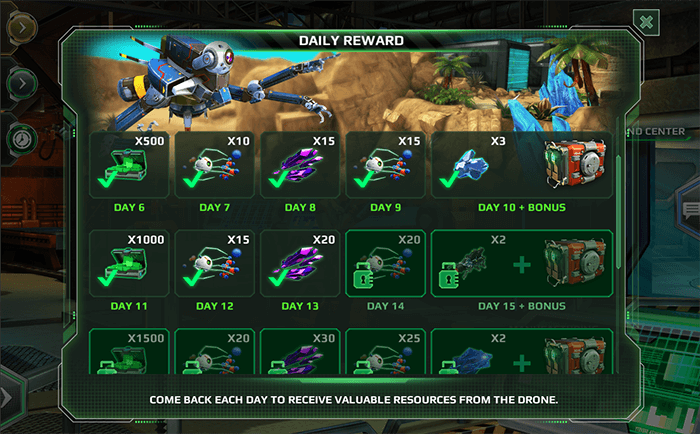 You won't be able to collect a month worth of daily rewards after, but you will start back at the last day you claimed. If you're into free Morbidium, you should post tips & tricks in this thread, yes. But that doesn't have to be a 100% success way for beating every PMC in the game, it can be a small tactic you use in every battle with AI. Well, every little bit of tactical skill helps me earn morbidium, and I really prefer to earn it by playing the game. Still, there's always good karma for helping newcomers. For instance, I hear that if the odds are against you in PvP at low levels, you can "kite" enemy heavies around, spending your sniper's points to move once and to stand in Sentry with your second point. Sure, but it would take forever to take those heavies down that way. And besides, the odds are practically always against you in PvP, unless you have everything maxed out, which of course you would not have done at "low levels". Last edited by StarQnaked; 06-03-16, 13:33. Last edited by ADVENT; 06-03-16, 20:53. Also I recommend to always carry a Deffender Class Heavy they are damage sponges on the battle field. The Dig in skill is their bread and butter a specially when you have taunt skill on them. This makes the enemies attack them SPECIFICALY because of the Taunt skill when you activate Dig in. Use that skill to stop large numbers of enemies attacking your guys at the same time. For example you have 3 snipers on your team, a horde of enemies gets too close for them to shot accurately and most of them need to re load. The Dig in skill make the enemy attack the heavy without thinking twice about their action. So what do you get? You can reload your squad and overvatch them or re position them.the heavy can still shoot them but never ever move until the skill is active or you will lose it for a long time period not to mention he loses the buffs he gets from that skill. But remember they can still die so always keep a medic scout near by to revive them or heal them. They also benefit from the armor plate MK2. This gives them more armor and makes them even more stronger. Last edited by ADVENT; 06-03-16, 21:07. The taunt skill is silly. Well-trained mercs should not be provoked that easily. You can just move to a safe distance and snipe the sorry fool. You may also use the Heavy's Intimidate skill to dislodge a digged in Defender if you prefer. It seems sensible to have as many different mercs as possible, but in reality it is better to have many of the same type. 3-5 mercs of the same type are always harder to beat than a mixed bunch. It is also easier to use a more structured Squad. For PvE, I prefer Support Scout, Heavy Destroyer, two Rangers and a Sharpshooter. More Sharpshooters instead of Rangers in PvP (Heavy is optional). I agree that the taunt skill is a bit OP but it does what its meant to do. But I would recommend a 50% of targeting the merc who activated the skill for the veteran mercs. But still the heavy defender is a damage soaker which is why I always have one on my A team makes enemies easier to kill. The only problem I see here Star is that when a Defender merc activates his Dig in the enemy team will stun him in PVP making him lit rely a wall made out of titanium you cant move him but the skill still works and happened to me more than once.